Hi everyone, and a very merry Christmas to all those who are celebrating today! I couldn't think of a better festive, holiday outfit than an adorable a-line LBD paired with cheery red, particularly cheery red plaid, and fur! I'll let you in on one of my deepest, darkest secrets...I am a confessed clothing hoarder. When plaid made it's grand re-entry into the world of trendy pieces for this season, I immediately fell in love. And thanks to my, and my mother's, incessant need to hoard clothes to the point they can be declared vintage, lo and behold was this jacket sitting in our guest room closet (yes, we shamelessly use it for storage and no, guests should not open that closet door). The best part? This jacket was made to fit an eight year old. I am 20-some years old. But I think it fits beautifully. Laura Ashley, why have you disappeared from the fashion world? 20-some year old me wants your fantastic plaid and floral printed items in sizes made for humans my age (which I will continue to hoard for my posterity). 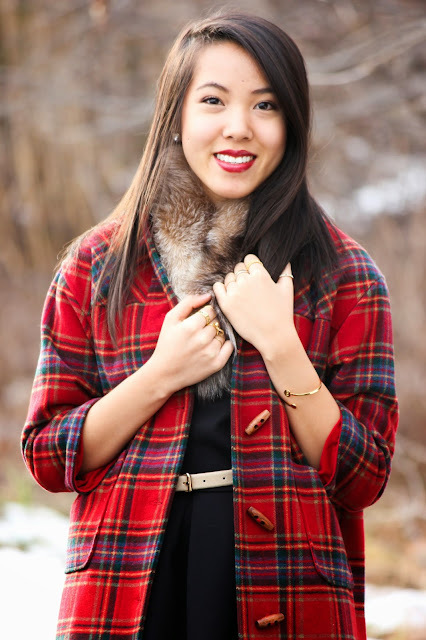 I love the idea of plaid and fur for a festive, luxe, glam pairing. I also love classic silhouettes like this a-line dress I picked up from Aéropostale. I was so pleasantly surprised with the quality of this dress! The material is quite a heavy weight and plus...it has pockets!! The minimal pleating on the front is beautiful, and it falls at the perfect length. I can't wait to use it as a basic piece for lots of other LBD pairings :) It also comes in a royal blue, which I didn't get a chance to try on but am now considering going back to the store for! They also have it in a very similar skirt version for those of you who prefer the versatility of a skirt over a dress. Add some gold jewelry and black tights if its cold, and you have yourself a very festive holiday look! Loooove your pumps Erica! Great holiday look. MERRY CHRISTMAS! hey, dear! long time no see! I have missed you over at my blog :) when it comes to this ensemble you're absolutely right - it's gorgeous. very fancy and flawless. my favourite part is that pair of shoes by the way. Merry Christmas!! That's so awesome that your mom kept this beautiful and stylish plaid coat. It looks perfect on you and I couldn't believe that it was made to fit an eight year old. I love faux-fur scarves and yours is so delicate and beautiful. You look so lovely!